Not all fly rod colors are depicted here. First, one quick explanation about SERIES numbers & COLOR numbers. 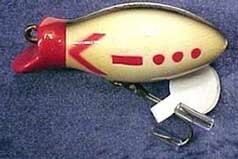 Each series of lures had a number designation. For instance the Wiggler lure was #100 series, The Baby Wiggler was #200 series, etc. Numbers were also assigned within each lure series for each color offered. For example #06 was assigned to the Goldfish color, #07 to Mullet pattern, etc. Therefore, a #100 series Wiggler in #06 Goldfish color was given the catalog #106 . And so it goes. This system of standardizing the colors wasn't introduced until 1925. Before that (1916-1924), it's necessary to consult a special chart to unravel the color codes! This mass confusion led to the standardized system mentioned above that was developed in 1925. The new system also contained some unusual quirks. Creek Chub often used the same number for DIFFERENT COLORS produced during the same era. Let me explain. A good example is the 00 (zero, zero) colors. Although there were at least twelve patterns that shared the 00 color code, only ONE was used for a particular series. Therefore, the company chose Chub finish for the #100 Wiggler series, a brown Pikie finish for the #700 Pikie lure, & Gray for the #3600 Lucky Mouse. The same system holds true for OTHER NUMBERS that were offered in two or more colors. Actually it wasn't that troublesome for a customer ordering from a catalog because the number & color was listed below each bait illustration. The buyer knew, for instance, that a #3600 Lucky Mouse was in Gray & not one of the other 00 colors. The purpose of this study is to assist those who might have trouble identifying certain colors. The data is geared for the neophyte but some experienced lure collectors might find a few nuggets of information that is valuable to them. Some patterns such as #00 Chub are often mistaken for #03 Silver Shiner or # 07 Mullet & the reverse is sometimes true. There are other colors that share the same dilemma. This can cause a problem, especially if a common color is offered as a rarer color! Creek Chub eventually began to reissue color codes that had been discontinued years before. These reissued numbers are OUTSIDE the scope of this study. For instance, if you have a late lure in the original box, it may have a color totally unlike that pictured here, but have the correct number for the later example listed on its box. With that said, please don't use any number or name on the end of a CCBCO box to determine the lure's color or model. Anglers rarely cared if they placed a lure back in the original box. Once you have identified the lure type, check it against the pictures that follow to find the correct color. ONLY CATALOG COLORS ARE LISTED HERE. NO SPECIAL COLORS. Used on only five different Original Series: #100, 200, 600, 800, 4300. A bait casting lure mistakenly numbered in the fly rod series was also offered in Chub - the F-10 Feather Casting Minnow! They all have an olive green head & back stripe. Scale pattern on the sides varies from a very small pattern to a larger scale. 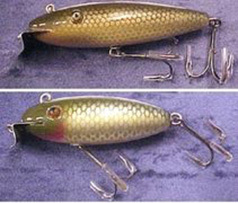 There are an untold number of color variations within the Chub pattern, especially in the early lures. Some have a blue streak by the green & some have light gold scales. This color is often confused with #03 Silver Shiner & #07 Mullet. Study the images closely. An army green & black pattern used only on the: #300 Crawdad, #400 Baby Crawdad. Also, known on the F-50 fly rod Crawdad series. First used c.1920 on the #700 series Pikie. It's a combination of brown & cream hues. The “stripes’ on the side were more prominent in the earlier years. Produced in a greater overall quantity than any other Creek Chub color, but not offered on as many models as some other colors. Produced until the company closed in 1978/'79. Four fly rod baits were also made in Pikie. You will notice a great variety of patterns within this designation. Generally a scarce color regardless of the series. Two fly rod baits are painted in a brown bug pattern. A pattern used only on the #1700 Poly Wiggle series. Small metallic green spots over a darker green body. Don't confuse this color with the #19 Frog pattern employed on many other series. This color was given two numbers during our study period. 00 was used on the #3600 Lucky Mouse series. Also, check #28 color if you have a Tiny Tim lure. However, there are many differences between the two patterns. The 00 code was used on the Frog pattern until 1933. See #19 for more information on the Frog pattern. Applied only to the #5000 Close Pin series. The top of the tail is sometimes red & sometimes golden yellow. This is a rare color on a rare lure. This pattern occurred only on the #3900 Sucker series discontinued in 1933. Another Black Sucker color was introduced in 1954 on the #9600 series Deepster (#9634). It is much different than the older motif. Applied only to the #2600 Jointed Pikie & #2700 Baby Jointed Pikie. The fore section is all glitter. The rear section is solid red. A scarcer lure on the #2700 series. An unusual combination applied only to the #2600 Jointed Pikie & the #2700 Baby Jointed Pikie. The fore section is all glitter & the rear section is solid yellow. Also, see 00-Y for Yellow Sucker. A paint pattern used only on the #3900 Sucker series in the early 1930’s. A gold/green scale pattern. Also, see Yellow Pickerel Pikie using this same color code. The earliest types have distinct side “stripes”, hand painted gills & fins. The balance of the body is a combo of deep green & small side scales, which become brighter yellow in later years. One of CCBCO’s best selling colors, although it can be difficult to find on CERTAIN baits. Three early fly rod baits were offered in this pattern. This is one of Creek Chub’s most popular colors. There are several variations within this color: some red heads were dipped at an angle; most are dipped so the line between the head & body is vertical. The airbrush painters would also blend the red into the white creating a “soft” edge. Darters are sometimes seen with a red bar extending on each side from the mouth. Two types of Red Head & White are shown. Several fly rod lures were sold in this color combo. Essentially an all white bait with a small red blush on the chin area. Applied on the #300 Crawdad & #400 Baby Crawdad series only. Certain other baits were produced in virtually all white, but were not given the Albino name. This is another CCBCo color code number that was used on several baits although there were many stylized differences incorporated. This #F202 Fly Rod Mouse was painted virtually all white (with a blush on the chin). Creek Chub called it a White Mouse but it was given a red/white 02 code. They used this number because the lure usually had red eyes, thus creating a red & white bait. However, some had black eyes. Also, see #17, which is a luminous white bait. This combination was offered only on the #6500 Baby Bomber, #6600 Bomber & #6700 Big Bomber series. The red & white lure had a black stripe on its back. The sides employed a sideways “V” & Morse code for “V” (dot, dot, dot, dash). The code is reversed on the Baby Bomber only! This WWII motif signified Victory over the Axis powers. It was discontinued after the war. An underrated color that was made on certain baits for a limited time & others for many years. This color is often mistaken for 00 Chub & 07 Mullet. A close comparison can usually help identify which is which. Some Silver Shiner baits have a faint pink stripe along the sides. This is the only color to use this number after CCBCO standardized the numbering system in 1925. Made for many decades so you will encounter different size scale patterns & differing hues of golden scales. A much different color than #06 Goldfish so don't confuse the two. Two early fly rod lures also used this pattern. 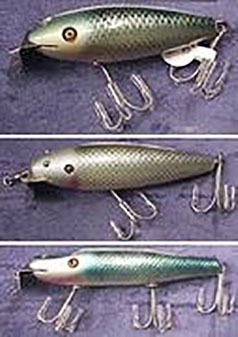 Creek Chub offered essentially four different major patterns with the #05 color code. The earliest has a faint red stripe down the side. It was followed by a large Red Scale, then a smaller Red Scale. Finally a Dace variation was introduced in the early 1930s. It has a blue area between the lure's back and the scale sides. It isn't clear if any of these variations overlapped each other. A beautiful color scheme first offered during the “Intro” era (pre 1921). As usual, there are variations in painting on this color because of its long tenure. It wasn't discontinued until 1954. The back is orange with golden side scales & the cheeks are either silver or gold. A later Goldfish was introduced in the 1960’s that was similar to the old pattern except it had silver background to the scales & the lure had tack eyes instead of glass eyes. Another late bait was the #06 Gold Scale. It was a real yellow/golden color (no orange). Both late baits are out of the range of our study. Only one of the early fly rod lures included this color. Another gorgeous color which was made for several decades. This fragile color fades easily, resulting in many hues . Some are very deep blue, while others are everything from lighter blue, to silver, and even green. Mullet is often confused with 00 Chub & 03 Silver Shiner. Although made for a long time, Mullet was produced on certain baits for a few short years. No early style fly rod baits were offered in Mullet. A very popular color. Produced on 24 different Original Series (#100-#9600) bait casting series. The early production rainbows have a silver back while the later ones within this study USUALLY display a blue back. Don't confuse the name with the totally different fluorescent Rainbow Fire (#31). 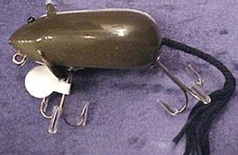 The cheaper Shur-Strike lure was also made in variations of this color. A scarce color on any bait. Produced only on the following bait casting CCBCo lures: #100 series Wiggler, #200 Baby Wiggler, #1800 Underwater Spinner Minnow, & #1900 Creek & River Fishing Lure. The pre-1920 examples will often exhibit a darker green scale pattern. You will also encounter a bronze/green shade & the more traditional light green design that is simply beautiful, at least to lure collectors. One clue to correctly identifying this color is the scale design. Instead of wrapping around to the belly area, it ends just below the eyes about ½ way down the sides. Don't confuse this with the Chub finish. There isn't a problem identifying this one. It's a simple white lure with a dipped blue head & it is a catalog color only on the #700 Pikie series (#710). Made until c.1949. The earliest examples (c.1920s) have a paler blue head. Not as scarce as the #10 Blue & White color. No trick to identifying this one. Also see #11 Black with Nite Glo. Made only for the #4100 series Jigger (#4111). Appears to be the same as the #11 White Head & Black except the head is luminous on the #4100 series. Some Creek Chub ephemera list it this way and others don't mention the luminous head. A very scarce color made for the Wiggler & Baby Wiggler only. Beware of repaints on this tough color. Use caution when buying this one. Obtain it from a reliable source that knows the lure's history. Three fly rod baits are known in this color. They have red bodies and red horsehair appendages. A very scarce color on MOST lures. It is usually available on the #2200 series Midget Pikies, #5100 series Dingbats & #3200 Plunker series. 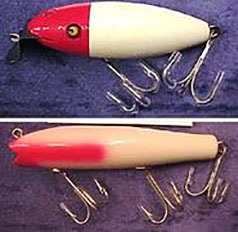 Similar to other solid colors, which are easy to repaint, beware of scarcer lures in this color. Buy only from a very reliable source. Three fly rod lures were cataloged in ALL Black. A very scarce color on many baits, but always available on #2000 Darters. The spots were airbrushed over a solid yellow. Some Darters in this color have painted eyes and some are without eyes. This color available on the: #300 series Crawdad, #400 series Baby Crawdad, and the F-50 fly rod Crawdad only. A combo of tan & army green. Not considered a rare color. This is an early number for this color. See #17 for full details. You will find this color combo on the #300 series Crawdad & #400 series Baby Crawdad only. The paint job is comprised of a steel blue & olive green. Sometimes the blue can be a more vivid hue. This white bait was offered in the 1925 catalog as #15 color on the #1500 series Injured Minnow. 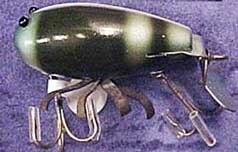 Tan Crab already used this number on the Crawdad & Baby Crawdad, so it was decided to change this luminous bait to #17. 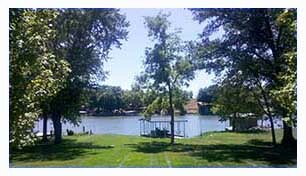 For the next few years it was sometimes listed as #17 color under the Injured Minnow & sometimes only in the general index of colors. Evidently this color wasn't a good seller because it was no longer listed anywhere by 1930. A catalog color on the #1500 Injured Minnow series only. Also, see #02 White which is similar in appearance. A very popular color. It was definitely one of Creek Chub’s best sellers. Available on 74 different bait casting and spinning lures plus a few fly rod examples! Characterized by the olive green head, chain stripe down the back & the side glitter. Generally common, but can be tough on certain baits.